Reprinted with permission from Collectible Automobile magazine. All copyrights reserved by Collectible Automobile. The other shoe has finally dropped at Ford. 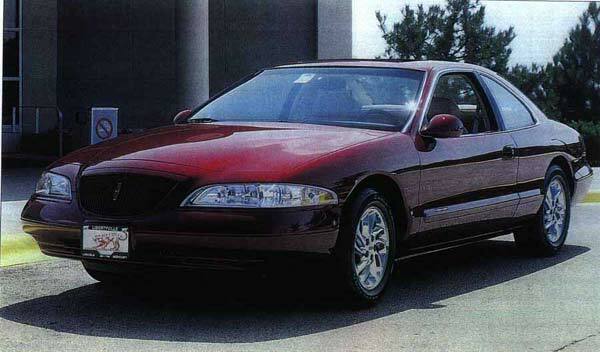 Or is that the other other shoe- When the 1997 model year rang down the curtain on the rear-drive personal-luxury Ford Thunderbird and Mercury Cougar XR7 (CA, February 1998), it was assumed that the related Lincoln Mark VIII coupe wouldn't be far behind. It wasn't. 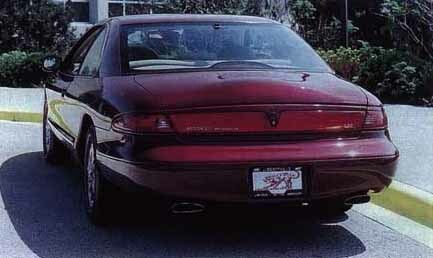 In January 1998, Lincoln-Mercurv Division announced it Wouldn't renew the car for another season. Mark VIII production-including 14,642 for the '98 model year--came to a halt at the Wixom, Michigan, assembly plant in June. Of course, Lincoln wasn't about to let its long-running image car depart the scene, ahem, unremarked. In line with a modern American custom often observed when a familiar automotive nameplate is retired, the final Mark VIII was offered in a gilt-edged Collector's Edition. For enthusiasts, this limited-run Lincoln is the latest car to revive a puzzling question: Does saying a car is collectible make it collectible, or does it have to earn its wings on its own- To determine that in the case of the final Mark VIII, it might be instructive to revisit the reception accorded the car at its introduction as a 1993 model. All four major monthly "buff books" reported on the latest member of the Lincoln Mark dynasty in their December 1992 issues. (Car and Driver and Automobile showed it on their covers.) Three of the four saw the Mark VIII as no less than a standard-bearer for American cars on the world stage. Road & Track gave the '93 Mark a subdued endorsement toward that end, but others were more effusive in their praises. "With the new Mark, there's once again an American luxury car that goes toe to toe with the rest of the world. This is as world-class as world-class gets, yet as American as lemonade on a sizzling Fourth of July" said Motor Trend. In evaluating the Mark VIII and the '93 Cadillac Seville STS, Automobile concluded, "The STS and the Mark are quite simply two of the best luxury automobiles that the United States has ever produced. In specification, price, and performance, they stand ready to take on the best the world has to offer." What the road testers for the national magazines found when they got their first looks at the Mark VIII was a larger and more liquid-looking car than the upright, thick-flanked Mark VII it was replacing. The new Lincoln coupe shared the 113-inch-wheelbase unibody platform and four-wheel independent suspension already in use on the T-bird and Cougar. Cordovan and Pearlescent White were the Collector's Editions color choices, the former available only with the special model. But that was about as much as they had in common. Under the hood sat a new dohc -4.6-liter V-8, its heads and block made of aluminum. The four camshafts featured powder-metal lobes strategically fixed to bars hollowed out for further weight savings. The fuel-injected 280-bhp power plant also employed a staged induction system with computer-controlled secondary intake ports. A wide-ratio version of Ford's 4R70W four-speed automatic overdrive transmission sent the power to the rear wheels. To keep things lively, Lincoln engineers sought ways to take out weight throughout the car. The all-independent suspension concept may have been borrowed from the Ford and Mercury coupes, but in the Lincoln the rear suspension knuckles and lower control arms were made of aluminum. So were the steering gear, differential, and one-piece driveshaft. Computer-controlled self-leveling air springs were employed at all four corners and also worked to lower the car's ride height by 0.8 inch once it was driven at 55 mph for more than half a minute. Other technical goodies included speed-sensitive power rack-and-pinion steering, antilock four-wheel ventilated disc brakes, and an optional traction control system that activated the brakes in low-grip situations below 20 mph. The whole package came wrapped in swoopy new bodywork with a sloping C-pillar reminiscent of the Thunderbird's acy roofline. Exceedingly slim halogen headlights flanked a vertical-bar grille that harked back to the 1940-41 Continental up front; a "spare-tire" hump on the decklid maintained the family heritage in the rear. The few nostalgic touches were limited to the outside. The interior was a futuristic split-level affair with a center console that canted its audio and climate controls in toward the driver. Seats were swathed in leather. "We decided to build a luxury car with sportiness, rather than the other way around," is how Paul J. Morel, Jr., program manager for the team that created the Mark VIII, described the process to Automobile. Judging by the comments in those early reviews, the car may have been a little sportier than intended. Writers were wowed by the 32-valve V-8 under the plastic-surfaced hood (another weight-saving trick), and cooed over such things as steering turn-in and overall ride quality. "It presents strong competition for the Cadillac Eldorado and a genuine alternative to the Acura, BMW and Lexus coupes," said R&T. The Collector's Edition was identified by gold-accented badges on its doors and decklid (top). The commemoratives interior (above left) got exclusive wood treatments on the steering wheel and shifter knob. 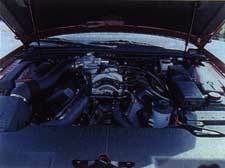 Under the hood was the Mark VIII LSCs 290-bhp 4.6-liter V-8 (above). The only consistent quibble was with the austerity of the interior panels. "Better plastic, some leather, or some wood accents (fake or not) . . . would warm things up," C/D concluded. 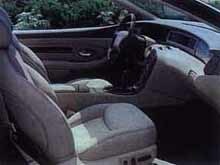 The comments about the interior were addressed in 1995 with a new console that got a dose of wood trim. That same year, bright tips called attention to the twin exhaust outlets that now extended through the rear-bumper fascia and an LSC version came out at mid-season, eviving the "hot-rod Lincoln" model first seen during the Mark VII's lifetime (CA, November 1985). The LSC's InTech V-8-as Lincoln came to call its 32-valve 4.6--generated 290 bhp at 5750 rpm and 290 pound-feet of torque at 1500 revs, versus 280 at 5500 and 285 at 1500, respectively, for the base engine, thanks to a freer-flowing exhaust setup. The LSC package also included a 3.27:1 final drive (as opposed to the basic 3.07:1 ratio), stiffer front and rear anti-roll bars, revised shock-absorber valuing, and a monochromatic exterior look. Further change came in 1997. A raised hood profile and reshaped grille opening graced the front, where clear-lens "Luminarc" high-intensity discharge headlamps were newly installed. A full width neon light bar was incorporated into the redone taillight ensemble for quicker lighting when the brakes were applied. The dual electro chromic exterior mirrors added ground-illumination and tilt-down features, the latter to aid vision when backing up. Inside, a memory power tilt telescoping steering column became standard, as did new door trim with burl walnut inserts and a leather-trimmed armrest and grab handle. New technical features included standard all-speed traction control and coil-on-plug ignition. Most importantly, Lincoln shaved the base price of the Mark VIII by $2370 in an effort to stir up sales. But they wouldn't stir. There's a sports-luxury market for "younger" luxury car shoppers alright, but these days it's geared toward sport-utility vehicles, not large V-8 coupes. (Lincoln recognized as much during '97 when it released the Navigator, a plushed-up variant of the full-size Ford Expedition SUV) Accordingly there was little change to the 1998 Marks. Nicer carpeting was installed and a cassette tape deck replaced the compact-disc player that came standard in the '97s. Prices rose by several hundred dollars. The Mark's fate had already been decided by the time the Collector's Edition was announced at the '98 Chicago Auto Show. With a list price of $40,890, a $1660 premium over the LSC on which it was based, the commemorative model came with a host of cosmetic touches. Gold special-edition badging was affixed to the doors and deck lid, and a gold Lincoln star sat at the center of the body-color grille. The center caps of the chrome alloy wheels had the Lincoln logo rendered in black. Paint choices were restricted to White Pearlescent and Cordovan, the latter available only with the Collector's Edition. Seats time in a choice of two-tone tan or gray, additional wood trim graced the steering wheel rim and shift knob, and model IDs could be found on the door panels and floor mats. Finally, Collector's Edition purchasers were presented with a boxed set of silver ingots depicting the original Lincoln Continental and its seven descendants. Talk about your lovely parting gifts. Assemblies began very late in the model year, and output of the commemorative cars came to just 1294, accounting for less than nine percent of the final Mark VIII's production. Therefore, rarity will be one argument in favor of keeping one for future investment (even if you don't care much for fussy gold schmaltz). The suspicion is that rarity would be far more important if Mark VIII in general had been more visible. Sleek and fast for their size (Consumer Guide reported a 0-60 mph time of 6.8 seconds for an LSC in its June '98 issue of Car & Truck Test), they nonetheless had the misfortune to share the Nineties with wildly popular sport-utilities and highly desirable luxury imports. When it first showcased the Mark VIII, Motor Trend lauded it as "a modern-day Duisenberg." Of course, if there really was a modern-day Duisenberg, it would probably need four-wheel drive and brush bars, too. If this was the last of the big, rear wheel-drive V-8 American coupes, the type died with its boots on. Mark VIII's twin-cam V-8 was a paragon of sophistication and smooth power. The 3900-pound two-door got around quite nicely on its tuned suspension and 16-inch wheels, the exterior styling had real presence, and the cabin was suitably opulent. In years to come, when we have to explain automotive extravagance to a generation that thinks that means a full-size sport-utility vehicle, we can point with pride to the Mark VIII Collector's Edition as another definition of the term. Though this car was all-new back in 1993, by 1998 it was woefully dated. As far as daily drivers go, the Cadillac Eldorado and Lexus SC are far superior. Even though it's the last of a breed that actually has some pedigree, don't expect it to appreciate anytime soon. Could this be the end of the line for the Lincoln Marks? If it is, then the Mark VIII Collector's Edition could well be very collectible... some day; in the distant future. Besides, it must be collectible; it says so in gold letters on both doors.